Update: Congrats to Anita #21! of the 50s and 60s. Full of color and motion. and layer cakes in the shop. Thanks for the chance to win. I'm especially fond of "Marmalade"
I love Marmalade! Bonnie and Camille's fabric lines are always so appealing to me. Thanks! They are all so gorgeous, love Marmalade! Thanks! thanks for the chance to win, they're all fabulous! All the fabrics are wonderful! but especially those Marmalade flannels! Thanks for the chance! Now I guess I'm different, I like the Mod Century - thank you for hosting. Yes please! My stash needs some solid fabric!! Oooh what a fabulous giveaway - thanks for giving us the chance to win - my favourite is Mod Century. Those Mod Century fabrics are so bright! Thanks for the chance, Corrie. Great giveaway! I've never used flannel but I do like 'Marmalade'! Oooo I would love the moda ones. Thanks for the chance! Thank you!!!!!! I love Flannel Marmalade Fabric!!! Thank you! I am a flannel lover (always back my quilts with it, so soft and cuddly!). I fell for the the Marmelade fabric. I love those flannels, so cute! Mod Century is cute, Marmalade is my favorite. I love Bonnie and Camilla's lines, and in flannel?? Gorgeous! Ah...it's so hard to choose! I really think Mod Century is fun...so I'll pick that one. =) Thanks a bunch. Oh, just love charm packs. It's so easy to make fast proyects out of them. And so hard to find here. 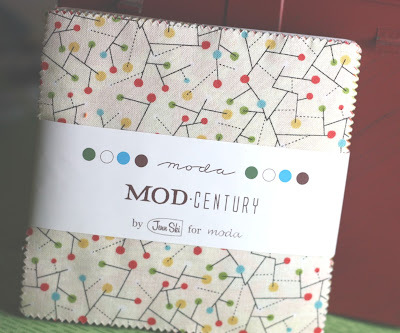 I am anxious to see the Mod Century fabrics as they look great in the online photos I've seen. Thanks for the chance to win! OOOOHHHHHH! Lots of eye candy. Thanks for the chance. the Mod century looks like so much fun. Much as I love Marmalade those Solids are too good to pass on,I could do so much with them. Thanks for the giveaway. I haven't used a charm pack yet, perhaps this will give me the kick along to try one! I like the look of Mod Century! Ooh. 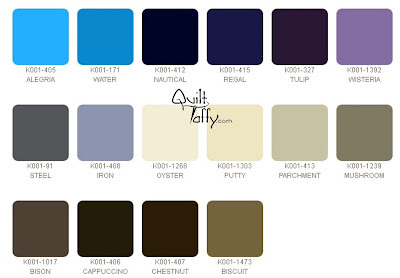 I would have to pick the Kona Solids - because I find it hard to buy solids with so many pretty patterns out there. I am loving the marmalade flannel! thank you! I just started my first charm pack project aand am now craving more! I would pick the solids - I have so few in my stash. I love the marmalade flannel. Ive never bought any pre-cut flannels before. I love the Kona solids! I seem to forget to buy solids and never have them when I need them! 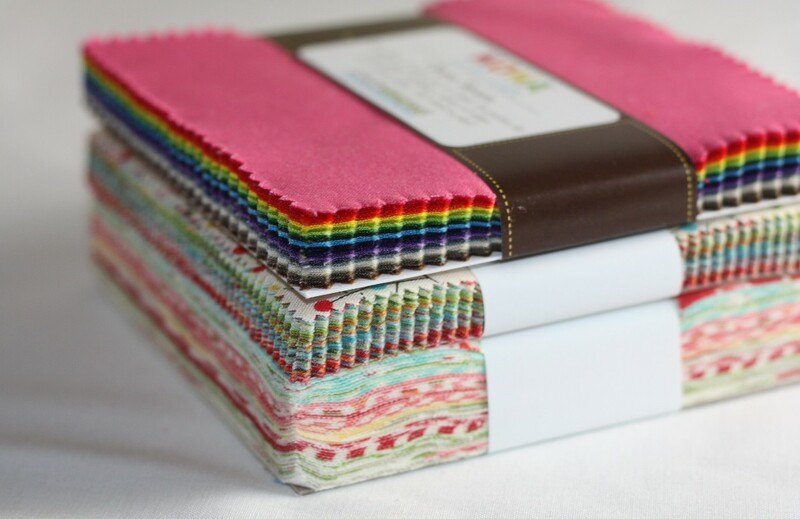 I`d love Kona solids.There are many beautiful patterns to play with it.Thanks for the giveaway! I love the Mod Century. Super giveaway. I love the new Kona solid colors! So bright and cheery! I've never seen precut flannel before! I'd choose the Jenn Ski fabric. I love marmalade....... anything with the aqua and red combination... thanks for the chance to win! The flannels would be a hit for pjs in the cooler months! Beautiful fabrics - all of them are luscious. Wonderful fabrics...I'd love to own each of them. Marmalade is fantastic,and Kona is always a must have. Thank you for this chance to win. I love all of those charm packs. It would be a tough decision, but I would make it, if needed :-) Thanks for the chance to win!! Thanks for the chance to win. They are all great, I don't know how the winner will choose. Did you know that it's always so much fun seeing new fabrics on your blog!!! I'm loving the mod century. Thanks for being so generous Corrie. Kona solids all the way! New kona please- i have been itching to get my hands on this one :) thank you!! How lovely they all are..and how generous of you. Would love to win! Love that Mod Century, it's very unique. Happy Thursday! Oh gosh they are all such a delight! Everyone could use those solids in their stash for sure! And Marmelade.. Mmmmm just gushing over those. I would love to check out the new Kona colors! Thanks for the giveaway. I choose Kona. Love Marmalade! Thanks for the chance to win! Thank you for the giveaway -- I am only just learning how much it adds to my project to include solids, and I would love to win the Kona charm pack. Thank you so much for the chance to win! What fun fabrics!!!! I love those "dots"!!! What great choices! I'd love the Kona charm pack. Thanks for the chance to win! Great giveaway! Count me in - love that Mod Century Stuff! Wow, those are all great. Really like the Mod Century, but I think I would lean toward the Kona solids right now. Thanks!! So much beauty! I just love the new Kona solids. 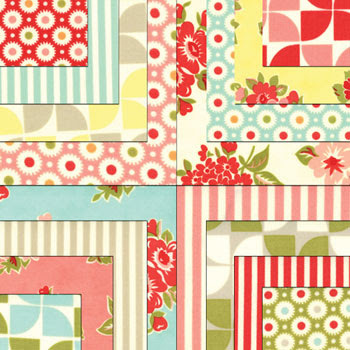 I love the marmalade fabrics...the prints are great as are the colors! Very sweet!!! I love the Mod Century!!! I love them all, favorite is Kona solids. I like that carrot color. I just love the marmalade! Thanks for the giveaway. I'm so eager to see Mod Century in person! It looks so bright and happy! I need to touch the Mod Century....just sayin'....thanks, Corrie. How kind to give us the choice, I think I love the Marmalade the most. Ooh. Marmalade Flannels sounds LOVELY! Thanks for the giveaway! I'm loving marmalade right now! Oh wow! Def the solids!! SO usable! Yay! Thank you for the chance. Great fabric! I love the Marmalade and the solids. Thanks for the giveaway! The solids would be put to excellent use! I totally love mod century! Although Marmalade does look pretty awesome too. Oh wow, the Marmalade is cute, but so is the Mod Century! Great trio; really like the Mod Century. Thanks for the chance to win. Fun choices! 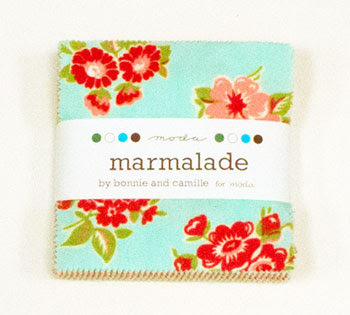 I'm a big Bonnie and Camille fan and love marmalade! They are all so pretty but the Mod Century really catches my heart. Thank you for the chance to win. Ohhh, I really like the Moda flannels. So pretty! I love all three of those but really love the Marmalade flannel! I love using the charm packs, fun to do quarter square triangles and great for charity quilts. Makes it easier than having to cut them out ourselves. love the Mod Century prints. Thanks for the chance to win! I love charm packs. Esp the way they're cut with the little scallops. WOW! 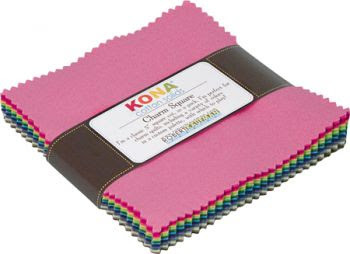 Kona solids in a charm pack. That's for me. I would love to win some Marmalade! Thanks for the giveaway. I love designer flannels, my kids have baby quilts made with them and they're still soft! The Marmalade flannels are adorable!! Thanks for hosting this giveaway! HELLO! SUCH A NEAT GIVEAWAY! Thanks for the chance to win. I love the Marmalade. Those solids look very yummy. Thanks. I love the new Kona solids!!! Thanks for the chance! I love Mod Century! Mod Century is fabulous. Thanks for the chance to win. Thanks for the chance! The mod century is cute! Would love to win Marmalade as I have never used flannel!! Thanks for the chance. Such wonderful colors today! Flannel charm squares have been on my list of things to try for a while now. 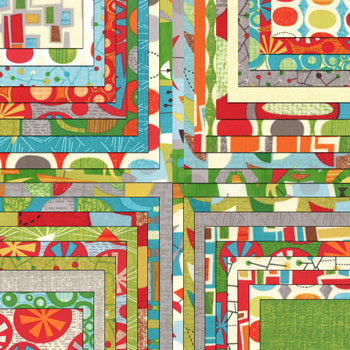 What a fun lap quilt they would make! Oh my gosh, Mod Century is TOO awesome! Thanks for the giveaway! I would choose the solids. Oh my goodness, I would love Mod Century! Great giveaway! I love the Mod Century, too cool! Golly, the Mod Century is the bomb! Thank you! This is my first peek at Mod Century, so that would be my choice. Thanks for another fun fabric preview. Any comment??? you are taking chances here..how about...I hate colds! but at least I'm getting it over with...!Thanks Corrie. Love mod century. I love Mod Century! I am all into bright and bold patterns! The Kona solids are so versatile. I especially like the Marmalade line, but the solids are spectacular too. Ooooohhhh! Look at those gorgeous Kona solids. Wishing here. Oh, flannel is so nice. thanks for the giveaway. All of those are lovely! Thanks for the giveaway! I just fell in love with Mod Century-it's so groovy! great looking fabric thank you for the chance to win! 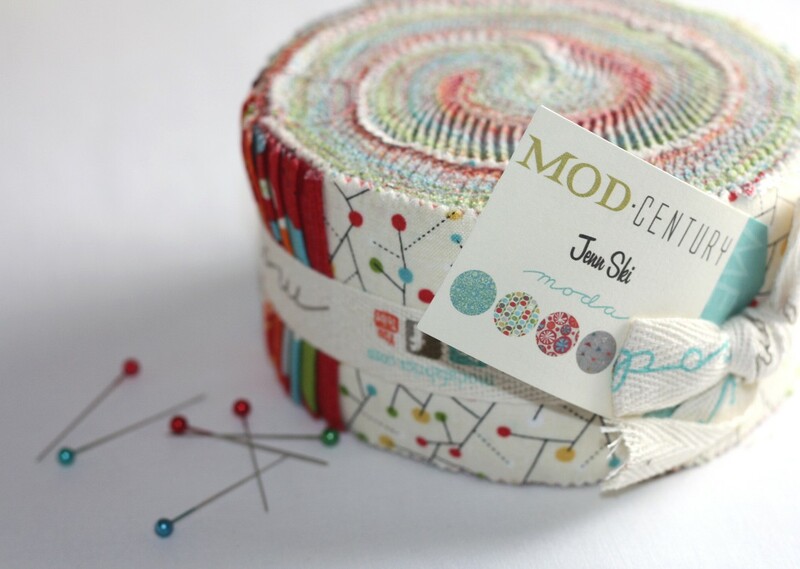 Love the new Mod Century fabric! Thanks for the chance at the great giveaway! Oooh, love the Mod Century! Great giveaway! Mod Century is so colorful. I could step out of my comfort zone with this one. great give a way :) Ty for the chance! I collect solids, but I really like the prints, too! Ooo, those solids are beautiful. Thanks for the giveaway! Cute, the mod century is so lovely!!! They are also wonderful, but I would love the Kona solids!! What a wonderful give away! Love all three of these colorful collections. Thanks for the opportunity to win! My favourite is Mod Century, thank you for a wonderful giveaway. I would be happy to get any of these! 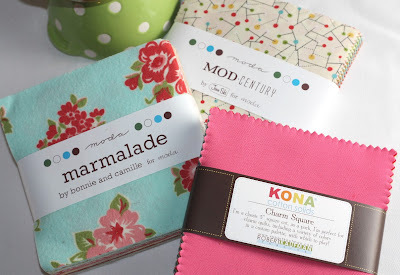 I didn't know they had released Marmalade in flannel, the Kona colors are awesome, and the Mod Century looks so fun. 'mod centuryy' with all its brilliant colors! thanx for the opportunity to win it. Those solids are so pretty but so are the other two packs as well! Thanks for the giveaway! I love the Marmalade and so excited it comes in flannels! I checked out the shop and dreamed.. put a few items I would love to have. plus this great giveaway. Hiya! What a decision!!! 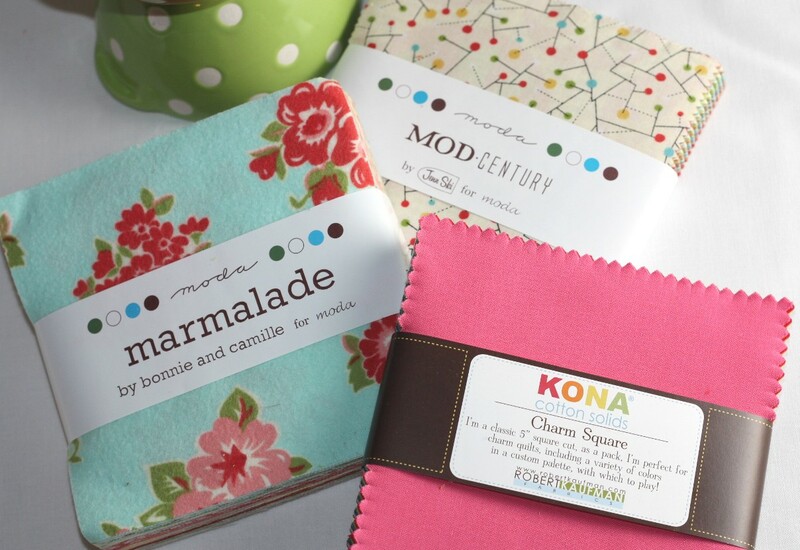 While I really love Marmalade, I'd have to pick the Kona solids---LOVE their new colors. Thank you for having the giveaway. Blessed be, hugs!!! You do have a great selection of charms. I think I could really use Merry Medley in a project I need to make ASAP. I really like Mod Century. It is really interesting. Thank you for sharing. What a great giveaway! I would be happy with anyone of them. Love the Mod Century...so fun! Thank you for a chance to win!! The Marmalade is my favorite! I'm in love with charm squares, and you have some lovely sets in your shop. Great prices too! What a great giveaway! I love the new Kona's...I've already got my hands on the kumquat and citrus. Thanks for the chance to win. They are all so wonderful!! I would love to win the Mod Century. I love all those colors!! I love Charm Packs! Thanks for the giveaway! I love the Mod Century and would love to win it. Thanks for the chance to win some yummy fabric. I love the Marmalade - and flannel, how fun! Beautiful fabrics! I love the Mod Century! Mod Century barely beats out the other two...fierce competition! Love the Mod Century too! Thanks for the chance to win! Oh my, such temptation!!! Thanks for the chance! I love the look of the Mod Century line. Thanks for the giveaway chance! The Mod Century looks fun! First I have seen of that line. Thanks for the chance at your giveaway! Love Marmalade!!! The colors are gorgeous. Love the charm packs. 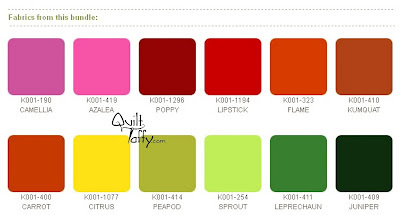 I need the new Kona colors to add to my color card. Thanks for the giveaway.